People who have summertime allergy-induced asthma often feel miserable at the time of year when they want to be outside the most. As the days of summer arrive, school lets out, and much-anticipated vacations finally begin, you're dealing with sneezing, wheezing, and coughing once again. Summer allergies can put a real crimp in your style. Some allergy-induced asthma produces problems year round because it's triggered by substances found in the everyday living environment. Other people only deal with the symptoms at certain times of the year if they have triggers that are commonly found outdoors rather than indoors. And still, others have allergy/asthma symptoms year round but find they get much worse in the summertime when summer triggers are most present. Kids with asthma and allergies may also have what is known as the allergic salute where they rub their noses upward because of itching and sport allergic shiners, which are dark circles under the eyes caused by nasal congestion. These are all just the typical symptoms of allergy-induced asthma. Nothing is different in the summer, except that if you are allergic to summer allergens, your symptoms may increase. The summer season can occur at different times in different parts of the United States and other countries, depending on climate and location. When grasses start to green and grow, though, chances are that summer allergy-induced asthma is about to begin. The most common summer allergens, or triggers, are grass pollens. Pollen is tiny egg-shaped male cells found in flowering plants. You may know pollen better as the tiny, powdery granules that plants use during the fertilization process. The size of a typical pollen spore is smaller in diameter than a human hair. The grasses mentioned above may or may not all exist in your local area. If any of them do, though, and you are sensitive to their pollens, then you will have summer allergy/asthma symptoms. The type of pollen that triggers allergies is a lightweight airborne powder, so it's easily spread far and wide on windy days. When it's rainy, though, the rain washes the pollen spores away and pollen counts tend to be lower, which brings relief from symptoms. 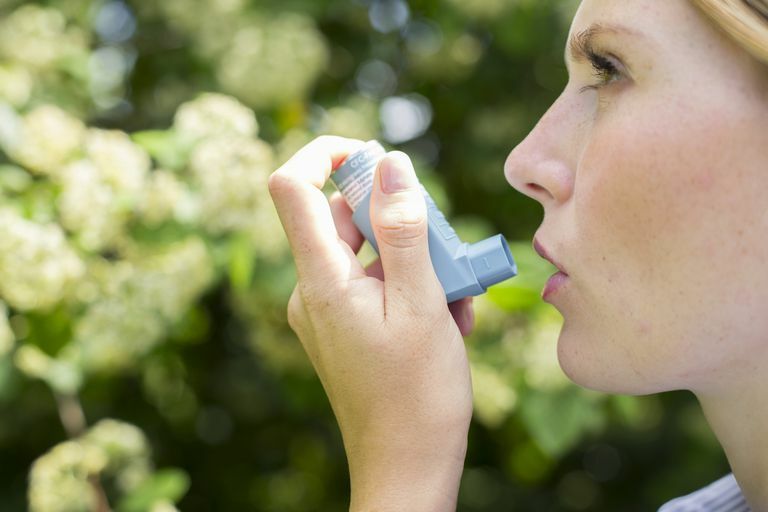 If you notice that your asthma and allergy symptoms crop up—or worsen—during the days of summer, there's a good chance that you have summer allergy-induced asthma. To find out for sure, make an appointment to see your doctor. Your doctor may decide to refer you to an allergist, who can do formal allergy testing to find out exactly what you may be allergic to. The good news is there's no reason why you should have to put up with summer allergies and asthma symptoms. There are easy steps you can take to keep your symptoms at bay. A combination of preventive actions and medication are usually all it will take. Pay attention to pollen counts for your area. You can watch your local weather forecasts or check at Pollen.com or the National Allergy Bureau to get your daily pollen counts. When pollen counts are high, stay indoors as much as you can. Pollen counts tend to be highest on warm, windy days and lowest on rainy days. If you must go outdoors during times when pollen counts are high, try to do it later in the day, as counts are usually highest early morning to midday. When you're indoors or in the car, keep the windows closed and the air conditioning on. Even if it's not hot out, turning on the A/C will keep pollen from blowing into your home or car through the window, especially if the air conditioning unit is equipped with a HEPA filter. Vacuum and dust your house's flat surfaces frequently. Dust collects on flat surfaces and pollen often collects in dust so cleaning will keep the levels down indoors too. It may help to wear a mask while you clean. Don't hang drying clothes outdoors. Clothes hanging outside to dry can collect pollen. Use a clothes dryer when pollen levels are high. If you must go outside during high pollen counts, wash the pollen off when you get back inside. Wash your hair to get rid of pollen and change your clothes. This might seem like overkill, but it can make a big difference in your symptoms. Oral antihistamines: Antihistamines are the most tried and true medications for treating most allergy symptoms. They work directly on the underlying allergic response. They can include first-generation medicines like Benadryl (diphenhydramine) and Chlortrimeton (chlorpheniramine). These are cheap, available over-the-counter, and generally effective, but can make you feel drowsy. The newer antihistamines such as Claritin, Zyrtec, and Allegra are effective and non-sedating but may be more expensive. They are also available over-the-counter. Some antihistamines are also combined with a decongestant to combat nasal congestion. Nasal decongestant sprays: These can work well for relieving nasal symptoms on a short-term basis, but they cannot be safely used throughout the summer allergy season. And, if used too much, they can actually make nasal symptoms worse. Nasal steroid sprays or nasal cromolyn sodium: These over-the-counter nasal sprays, such as Flonase, are some of the most effective medicines and because they act only where needed, are also some of the safest. Eyedrops: There is a wide variety of eye drops that can be used for eye allergies. Use caution in using drops like Visine Allergy, though, as they can make symptoms worse if they're overused. Natural tears-type eyedrops are the gentlest and may work for mild symptoms. More severe symptoms may respond well to an antihistamine eye drop like Alaway or Zaditor, both of which are available over-the-counter. There are also prescription eyedrops available that may be helpful. Saline rinse: For those who want a more "natural" approach, a saline nasal rinse/irrigation is both gentle and effective. The idea is to wash out pollens, other allergens, and mucus from the nasal passages by flushing them with salt water (saline). These preparations are available over-the-counter in most drugstores. If your allergies and asthma get worse in the summertime, don't feel as though you just have to suffer. Take action! You can feel better and continue to live a full and active life, even in the face of summer allergies. Talk to your doctor before summer begins to make sure you have a plan in place in time. And, if you plan to take an oral antihistamine, remember that it can take up to two weeks for it to reach full effectiveness, so be sure to start taking it before you expect summer allergies to start. If you have asthma year-round, but your nasal allergies and eye allergies are more seasonal in nature, it's important to stay on top of the allergy symptoms, so that you can nip them in the bud quickly. When nasal allergies spiral out of control, asthma often follows, even if it has been stable before. American Academy of Allergy Asthma & Immunology. Outdoor Allergens. American Academy of Allergy Asthma & Immunology. Rhinitis (Hay Fever). American College of Allergy. Asthma & Immunology. Ragweed Allergy. Published 2014. National Heart Lung and Blood Institute. Expert Panel Report 3: Guidelines for the Diagnosis and Management of Asthma. Published August 28, 2007. Can You Still Have Allergies and Asthma During the Winter? What Can I Take For My Snifling Nose While Pregnant With Asthma? What Hay Fever Treatment Options Are Available? Is Extreme Heat Making Your Summer Asthma Worse?